This introduction to the terminology of Business Intelligence covers some of the basic concepts often discussed in Analytics software and reporting. While the concepts can and do fill many books, current HR software typically does not contain the breadth of data required to go beyond the basics covered below. However, the rapidly approaching next generation of software will enable Human Resources experts to play a critical role in competitive business strategy. We often talk with clients struggling to make sense of the shift from operational “reporting” to Analytics. Many clients still stuck in transaction reporting mode have a difficult time seeing how truly transformational Analytic/Strategic reporting can be for HR. To complicate matters, most legacy tools are not built for anything except transactional reporting. Limited to small time scale or points-in-time (today, this month, this year, last year). Volume often is limited enough to read in table format only, less graphical representation needed. Often limited to data 0-3 years in age on average. Static output (basic sort and total functionality if you are lucky). Operational Reporting is most often best served real-time from transactional source systems due to to the detail required and time sensitivity in data. View consolidated data points across a timeline (ex: 2009-2013). Due to the high volume- often has to be presented graphically. 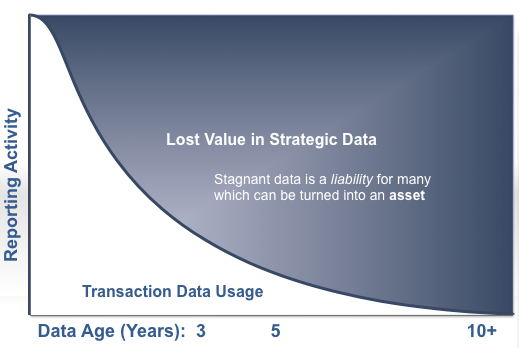 Often accesses data 1-10+ years in age. Helps identify correlated trends over past time periods. Supports estimates or forecast probability (prediction) of future trends for planning. Output is often dynamic and interactive. By nature can be less time-sensitive. Analytics let you see the “forest”, transactional reporting lets you see the “trees”. 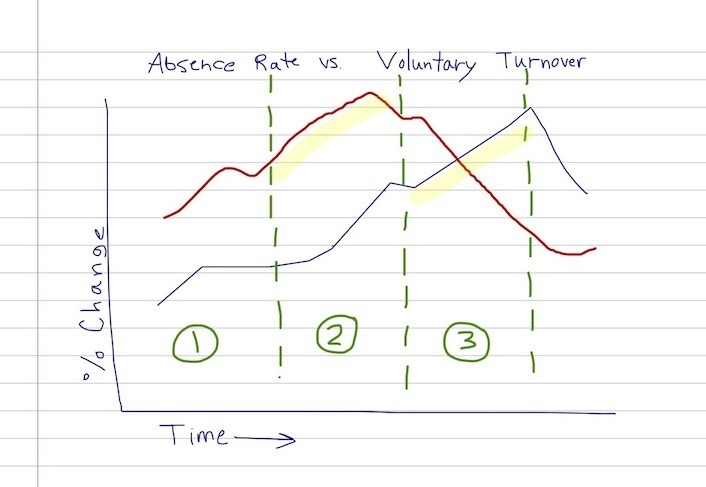 The above represents the number of employees who voluntarily left the organization during a the time period selected. While facts are always open to interpretation, the actual calculation of a fact should be a fixed measurement charted over time for different segments of an organization. They can be absolute counts, percentages, ratios, or any other mathematical measure. Metrics or facts are also often synonymous with “KPIs“ ( Key Performance Indicators ). correlation (can be a Positive or Negative relationship): in a sample set of data with 2 groups, this is the strength with which the 2 groups relate to one another on some metric across time. Graphically, a positive relationship is demonstrated by 2 lines moving in parallel across time – as one metric goes up the other goes up (as seen below) and vice versa. 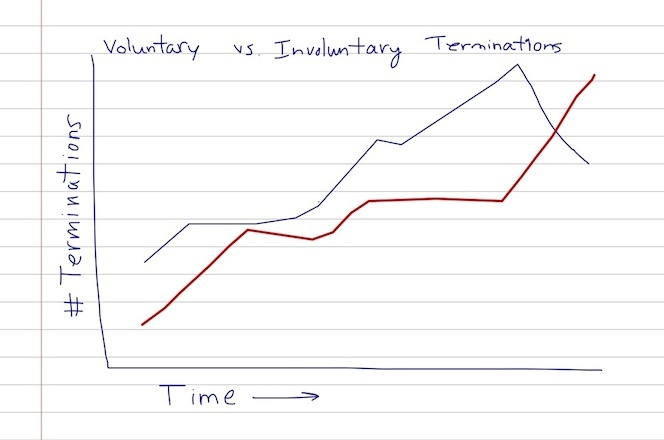 The above displays the number of voluntary leavers graphed alongside the involuntary terminations for a time period. inverse correlation (also called a Negative Correlation): in a sample set of data with 2 groups, this is the strength with which the two metrics are opposed to one another, moving in opposite directions. 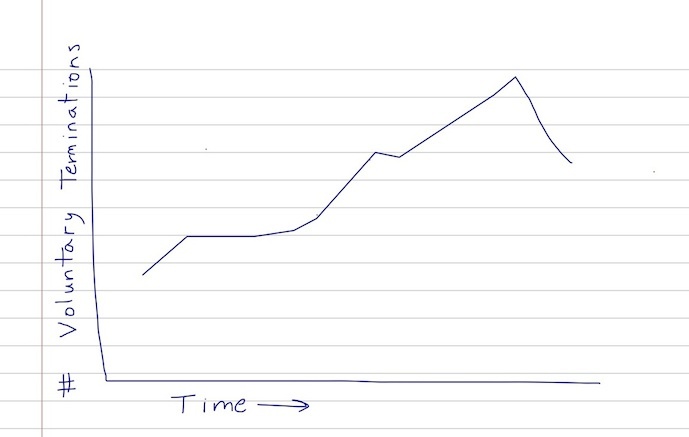 Graphically this relationship is demonstrated by 2 lines moving in opposite directions across time – as one metric goes up the other goes down, like an “X”. time series: a block of data points for a defined time period (for a specific metric or fact) which, in the Human Resources domain, is typically represented by a monthly, quarterly, 6-month, or annual period. This permits an analytics engine to compare a metric over different time periods to check for correlations or inverse correlations. It also enables software to perform predictive analytics on future metrics based on actual historical data. See the time series graphic below. regression modeling: A regression model simulates probable outcomes of a particular metric based on other correlated metrics or variables. For example, I may want to predict (assuming there is a correlation) probable turnover in the next 6 months based on an increase in the absence rate over the past 6 months. In the graph above, the time period is subdivided into 3 series to compare each period to the others to check for a relationship between the two metrics (1-versus-2, 1-versus-3, and 2-versus-3). The faint yellow shading highlights a seemingly strong positive relationship between absence rate increase in the 6 months of segment number ‘2’ and the voluntary leaver rate in segment number ‘3’. Meaning, an increase in absences may be pointing to future increased employee departures over the next 6 months. These can be further broken out into the different time periods described above (3, 6, 12 month segments) for a more detailed analysis of positive or negative relationships (correlations). These confirmed relationships are then used to estimate probable future outcomes based on data currently available for regression modeling. Regression models can get far more complicated where data is available, but in Human Resources companies are mostly limited to the typical scope of HRIS data which does not currently enable highly complex models like those which may be more frequently leveraged in Financial applications. Keep an eye out for our upcoming post on predictive analytics explaining how some of the above methods work for a better understanding of the uses and limitations. As a result, companies can make use of data that was previously prohibitive to collect and synthesize. We are now able to incorporate social networking, geographic, and labor market data freely available across the web to find and retain the best talent. At Fuse Analytics, we are pushing the limits of these new analytic capabilities in Human Resources. We help you transform the HR function into a strategic business partner by consolidating your HRIS applications and harvesting external data to provide an easy-to-use, 360-degree view under a single global reporting platform. Contact us at info@fuseanalytics.com to request a demo or learn more.